It is said that an image speaks a thousand words. But, there are occasions where anything less than a thousand words would suffice. Having said that, I would like to indicate a slight departure from the previous two writers, in that I shall try to fill my blogs with more words than pictures. Please let it be known that I do enjoy photography and images to a great extent, however I choose to experiment with my language manipulation abilities (or lack thereof..!). Let us say that it is just to conduct an “experiment” within the experiment that is viehebdomadaires. That being said, there is good reason for my choice. The first being that it is more interesting to write at this point of time than it is to put up pictures. Secondly, I am out of fresh photos as I decided to leave behind my Fotoapparat on my last trip (the decision might have been a result of Easyjet’s baggage policies and my unwillingness to pay extra for a check-in bag). Getting all that introductory stuff out-of-the-way, I have taken the liberty of putting up a photo made by my wife on our last trip. 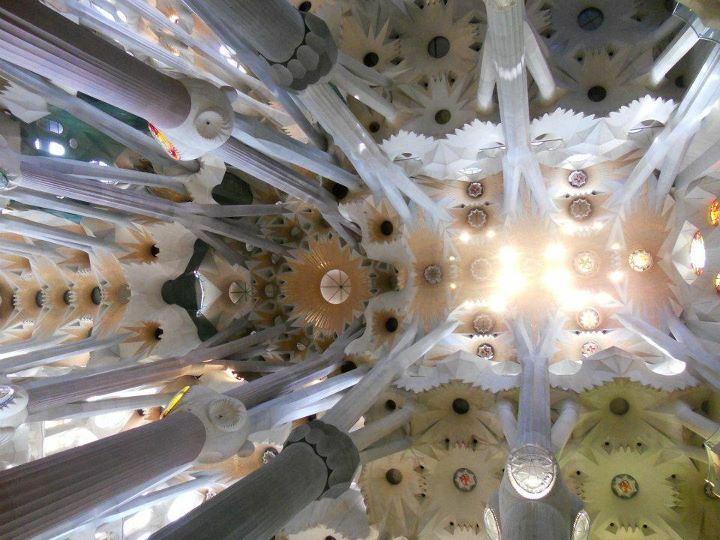 If you haven’t guessed it by now, I suppose I should tell you that the photo is the ceiling inside the Sagrada Familia in Barcelona, Spain (which – believe it or not – has been under construction since the late 1800’s… so much reducing construction times with advances in technology.. :D). Barcelona is a beautiful city as far as tourism is concerned. I personally hold no great love or admiration for Spanish (as a language) or for architecture (buildings are just buildings after all!). But the trip to Barcelona has made a convert out of me on both accounts. I am just rearing to learn Spanish right now and hopefully will travel to the different Spanish-speaking countries in the world, just to get a feel for the different aspects and perspectives of different cultures that have been touched and influenced by Spanish culture in the past. Architecture… where do I begin. The work by Gaudi is unbelievable. After seeing his work, I believe that if his work was shown to students in high-school/secondary school, they would benefit from a much better understanding of conic sections than they do with the dry problem solving methods that are presently in use in classrooms the world over. The architectural design, the attention to detail is simply amazing! That being said, I will abstain from describing all of his work in detail… I will leave the rest of Gaudi’s works for you to discover. As you may have discovered by now, my trip was to Barcelona. Apart from being a city with Gaudi’s wonders, the city itself is very well planned. It has been thought out for the visitors to the city; the metros are clean; there are announcements in multiple languages at every stop along the train lines (not just at the main stops as is the case in supposedly wonderful Paris). The food is wonderful and the Beer is VERY INEXPENSIVE to say the least! And can ANYONE be unhappy about so many clean beaches along the Mediterranean coast just beckoning to him/her? Wonderful weather… 26°-27°C towards mid-September… well thought out entries and walkways in the Airports and train stations… All the simple stuff that just requires some attention to detail and some practical thinking makes the city so much more enjoyable. A genuine heartfelt Kudos to the city planners and designers who remade much of the city for the 1992 Olympic games (the Olympic games village is another joy to visit). As someone living in Paris, I wish the Parisians would learn something from the Spanish (who, according to the European stereotypes are always on Siesta). I do have some great friends and colleagues in France, but I do sincerely wish that they would stop giving non-French people bull about “Le grandeur Française” as a justification for their bureaucratic deficiencies. I am even more incensed by the French sense of modern architecture … especially considering a French architect put a “skyscraper” that looks like a gigantic D***o in the city of Gaudi, in beautiful Barca (it is called the “Torre Agbar”.. do google it and you will see what I mean)!!! Well, all that apart I had a great time in Barcelona. It’s tourist attractions, the beautiful ancient docks; the harbours filled with racing boats, yachts and cargo ships; the bars with cool live artists… and so on and so forth!!! Sigh… I do miss Barcelona after just two weeks there. I will not talk more about my trip to Barcelona (in my future posts this week). It is a wonderful beautiful city and I would recommend it to anyone who shows any minuscule amount of interest in visiting Spain. The word count on this post is not past 900 words. So I suppose I have said all I wanted to say today without actually needing a couple of pictures to say it all (that would be thousands of words… :P). So I rest my case that words can do the job better than pictures sometimes. … Hope you all get to see the Sagrada Familia in real… Hope to see you in the next post! Edit: A particular word in the paragraph just before the two-point conclusion has been moderated to suit varied personal sensibilities.